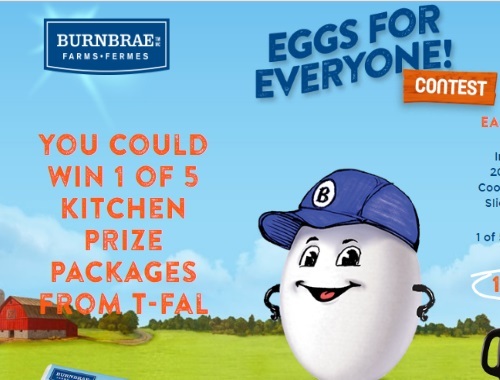 Burnbrae Farms is giving out Eggs For Everyone in their new instant win contest! Enter to win 1 of 5 Kitchen Prize Packs from T-Fal or 1 of 1000 Free Product coupons! 5x Grand prize packages available to be won consisting of: T-Fal Intuition 9pc Cookware Set, Intuition 20/26/30cm Frypans, Intuition Jumbo Cooker, ActiFry Express XL 1.7 kg, Express Control Kettle and Avante Icon Toaster 4-SL. Approximate retail value $1,180 CDN. 5x Secondary Prizes consisting of Burnbrae Farms Gift Baskets, including one (1) $50 CDN Visa Gift Card and Burnbrae Farms free product coupons and merchandise. Approximate retail value $200 CDN.